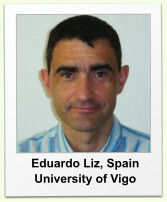 Short Bio Eduardo Liz is professor of Applied Mathematics at University of Vigo, Spain. He received his undergraduate degree from University of Santiago de Compostela, Spain, in 1990, and earned his Ph. D. from the University of Vigo in 1994. His research was focused on the global dynamics of Functional Differential Equations and Difference Equations, paying special attention to their applications in Mathematical Biology. Professor Liz has been the leader of various national and international research projects, has published more than 70 scientific papers in international journals, and has delivered more than 20 invited and plenary talks in international conferences. He has served as referee for more than 50 international journals, and for science foundations of Spain, Chile, Czech Republic, and Slovakia. 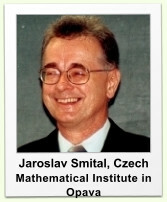 Short Bio Jaroslav Smital is a professor of mathematics at the Silesian University in Opava, Czech Republic. He was born in former Czechoslovakia. He received his PhD, and later DSc, at the Comenius University in Bratislava (now in Slovakia) in 1972. He worked at this university until 1993 when he moved to Opava. Smital's main research areas are real functions, functional equations and, during the last 25 years, dynamical systems. He is an author or coauthor of about 100 papers, and 10 books. Since 1995 he is a Fellow of the Learned Society of the Czech Republic. Short Bio Michal Misiurewicz was born and grew up in Poland. He studied at the University of Warsaw, where he received his Master degree in 1971 and PhD in 1974. He learned dynamical systems and ergodic theory from Karol Krzyzewski and Wieslaw Szlenk. He worked first at the University of Warsaw, and since 1992 at the Indiana University - Purdue University Indianapolis (Indiana, USA). Misiurewicz's favorite topics are one-dimensional dynamics and topological entropy; he even wrote a book about those subjects. From time to time he likes to work on problems that are motivated by or have application to other sciences, like biology, chemistry, physics or economics, and his most "applied" paper is about lacing shoes. He is an author of about 140 papers. A remark by the organizing committee: Professor Misiurewicz is the winner of the Bernd Aulbach Prize for the year 2013. The Aulbach Prize is awarded by the International Society of Difference Equations for significant contributions to the areas of difference equations and/or discrete dynamical systems. 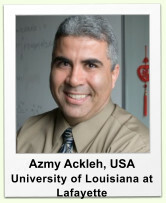 Short Bio Azmy S. Ackleh received his Ph.D. from the University of Tennessee at Knoxville in 1993 under the supervision of Thomas G. Hallam. He then joined the Center for Research in Scientific Computation at North Carolina State University as a postdoctoral fellow until 1995 where he became an Assistant Professor of Mathematics at the University of Louisiana at Lafayette. In 2000 he became an Associate Professor of Mathematics and in 2003 he became a Full Professor of Mathematics. In 2007 he was selected to become the R.P. Authement Eminent Scholar and Endowed Chair in Computational Mathematics at the University of Louisiana at Lafayette. Ackleh’s research is in the area of Mathematical Biology. He has published more than 100 peer- reviewed articles in this area. He is particularly interested in the development of continuous and discrete models in population ecology and epidemiology and in using mathematical tools to understand the short-term and long-term behavior of solutions to these models. He develops numerical methods for solving nonlinear PDEs arising in such applications and uses these numerical schemes to analyze the solution behavior. He also applies functional analysis and dynamical systems approaches to study stability and persistence properties of populations. Particular applications that he has worked on include selection-mutation models, amphibian dynamics, the interaction between blue and yellow irises, and the impact of oil spills on marine mammals in the Gulf of Mexico. Short Bio Henk Bruin was born and grew up in the Netherlands. He completed his Master Degree in Groningen, working with Henk Broer and Floris Takens. After receiving his PhD in 1994 at Delft University of Technology, under supervision of Jan Aarts and Sebastian van Strien, he had postdoctoral positions in Erlangen (Germany), KTH Stockholm, CalTech and Groningen, before, in 2003, becoming a permanent member of the ergodic theory group at the University of Surrey. In 2012, he accepted a position as Professor Ergodic Theory and Dynamical Systems at the University of Vienna. Bruin’s research is predominantly in the ergodic theory of smooth non-uniformly hyperbolic dynamical systems, and as such he iterated interval maps longer than is probably good for him. His further research topics include complex and symbolic dynamics, and topological dynamics and continuum theory. 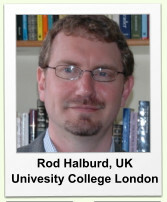 Short Bio Rod Halburd is a professor of mathematics at University College London. He was born and grew up in Australia. He received his BSc from the Australian National University and his PhD from the University of New South Wales. He worked at the University of Colorado at Boulder and Loughborough University before starting at UCL in 2007. Halburd's main research areas are integrable systems and complex analysis. He has explored several properties that appear to be good detectors of integrability in both the differential and discrete cases. Many of these properties are complex analytic in nature but some are from number theory. Recently he has been proving that, within certain classes of (generally non-integrable) second-order ordinary differential equations, the only singularities that can develop in the complex domain are algebraic. Short Bio A native of Austria, Arno Berger was educated in mathematics and mechanical engineering at the Technical University in Vienna. Since completing his PhD in 1997, he has held faculty positions at TU Vienna, the University of Canterbury (New Zealand) and, since 2007, the University of Alberta (Canada), as well as long-term visiting positions at Georgia Tech (USA), Warwick (UK), and Frankfurt (Germany). Berger's interests in dynamical systems are diverse, ranging from ergodic theory and topological dynamics to applications of stability and bifurcation theory in science and engineering. He is also interested in various problems in analysis and probability theory that are motivated by or related to questions in dynamics. For several years, his favourite occupation has been the study, in dynamics and elsewhere, of digits and significands and their ever-intriguing properties. Short Bio Martin Rasmussen was born in Germany. After receiving his PhD in 2006 at the University of Augsburg under supervision of Fritz Colonius and Bernd Aulbach, he held postdoctoral positions at the University of Augsburg (as Fellow of the State of Bavaria, 2006-2007) and Imperial College London (as Marie Curie IEF Fellow, 2008-2010). 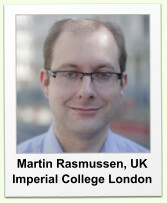 In 2010, Martin Rasmussen was awarded an EPSRC Career Acceleration Fellowship (2010-2015) at Imperial College London and subsequently became a permanent member of their dynamical systems group DynamIC. Martin Rasmussen's research is mainly concentrated on nonautonomous and random dynamical systems, with emphasis on bifurcation theory. He has also made contributions to stability and attractor theory, Morse decomposition theory and invariant manifold theory. Martin Rasmussen is author of two books on the qualitative theory of nonautonomous dynamical systems (published by Springer and the AMS). Short Bio Hinke Osinga specialises in the development of computational methods to help understand the behaviour of dynamical systems, with applications in biology and engineering. Her main research interest is the study of bifurcations of global invariant manifolds in a parameter-dependent setting, and more recently she generalised these ideas to the study of slow manifolds in systems with multiple time scales. 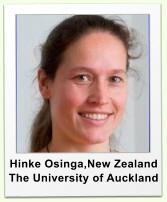 Hinke is Professor of Applied Mathematics at the University of Auckland, New Zealand, having held previous positions at the Universities of Bristol and Exeter in the UK, and Cornell University, California Institute of Technology and the Geometry Center in the USA. She obtained her PhD from the University of Groningen, the Netherlands. While at Bristol, she held an Advanced Research Fellowship from the Engineering and Physical Sciences Research Council 2005-2011.